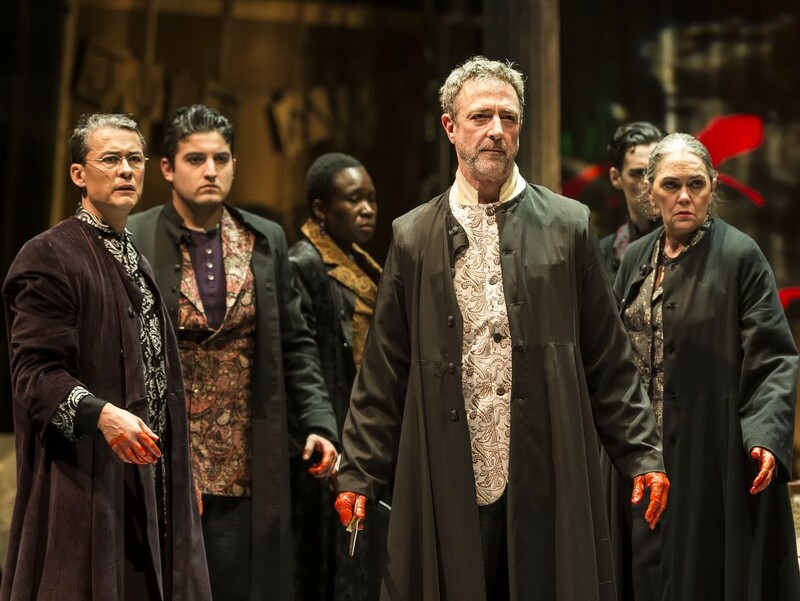 The thing about classic theatrical works is that sometimes they fall prey to the modern suspicion that anything said in old and/or artful language loses its ability to connect with a contemporary audience. One could argue that this is short-sighted and looks down on the audience’s ability to stretch intellectually. On the other hand, remembering that these plays were originally speaking to people in their own time, perhaps updating the language of a work can add back the freshness it had when new. As someone who grew up surrounded by people who appreciated Shakespeare, I admit to an abiding suspicion of updating done for its own sake. Thus, I approached the production of Moliere’s “The Imaginary Invalid” at A Noise Within with a certain amount of skepticism. The production of this 343-year-old play uses a 9-year-old adaptation by Constance Congdon based on a translation by Dan Smith, and adaptation – often rather fanciful – it is. Still, what is lost in the artfulness of some of Moliere’s poetic style (even in translation), is gained back again by focusing on the spirit of the piece as a send-up of both severe hypochondriasis and the bamboozling nature of the medical quack. In this it succeeds with all the silliness and elaborate double entendre that one could ask for. The tale, as with other of Moliere’s best work, seems remarkably timeless, and very silly. Argan is a wealthy man obsessed with his own ostensibly failing health. To save himself money, he has decided that his daughter will marry the nephew of his doctor – also recently become a doctor – so there will be medical help in the house at all times. Meanwhile, his much younger wife plots to absorb all her husband’s money and avoid paying the dowry required in a marriage by sending his daughter, her step-daughter, to a convent. The daughter, Angelique, having fallen madly for a young man she met at the theater, is appalled at her father’s marriage arrangements for her. The wise servant Toinette observes all of this, and works to wise up Argan, and sort things out in Antoinette’s favor. Artistic co-director Julia Rodriguez-Elliott has given this piece a nice balance between the cartoonish and the historical, though there are still a few oddities for which ANW productions of antique comedies are known. The play has been developed as a combination of French farce, with the elaborate timing of comings and goings which enhance the comedy, and an old fashioned melodrama complete with sound cues to announce the villain. It works fairly well, filled with silliness and innuendo, and performed as it is by a fine ensemble. Apollo Dukakis has a lovely time as the jaw-droopingly self-absorbed Argan, delighting in his supposed knowledge of his own mostly fanciful ailments. Deborah Strang shines once again as the practical and often annoyed Toinette, providing a solidity which balances Argan’s flightiness. Kelsey Carthew makes Angelique impressively air headed, even as she decries her status as a pawn in the hands of her elders. Carolyn Ratteray gives Argan’s wife a delightfully comical aversion to her husband, and enough personal villainy to fit the melodramatic plot. Jeremy Rabb makes Argan’s doctor richly pompous and amazingly agile at spouting multi-syllable words for conditions that don’t exist. Rafael Goldstein provides an appallingly, comically awful potential husband for Antoinette as the doctor’s nephew. As contrast, Josh Odsess-Rubin creates a gentle earnestness in Cleante, the man Antoinette actually loves, making her choice all the more obvious. As two rather slimy characters after their own segment of Argan’s money, Freddy Douglas not only makes each broadly different from the other, but impressively memorable as well. 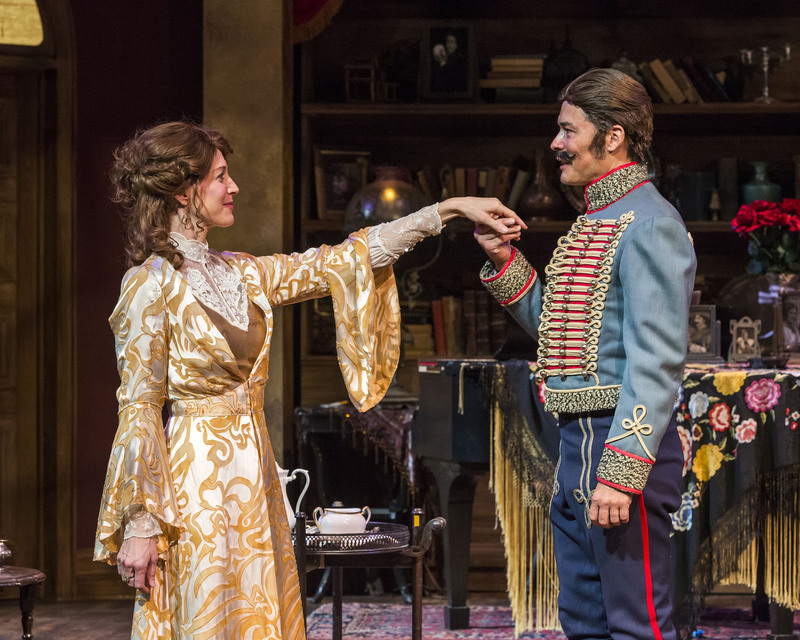 The scenic design by Angela Balogh Calin make good use of the basic communal pieces shared by other plays in ANW’s fall repertory, while her costume designs range from subtle to florid as the character demands. Rodriguez-Elliot’s wildly elaborate ending, including a costume made from a parachute, seems almost over-much for what is generally a more intimate if silly adventure, but by and large this comedy is worth seeing for many reasons. In the end, the themes of desire, skulduggery and gullibility, not to mention the sensible observational nature of the servant class, are all Moliere. That we readily accept the idea that a doctor would make up illnesses to keep himself employed by a hypochondriac proves how thoroughly the concept has echoes in modern, pharmaceutically swollen times. 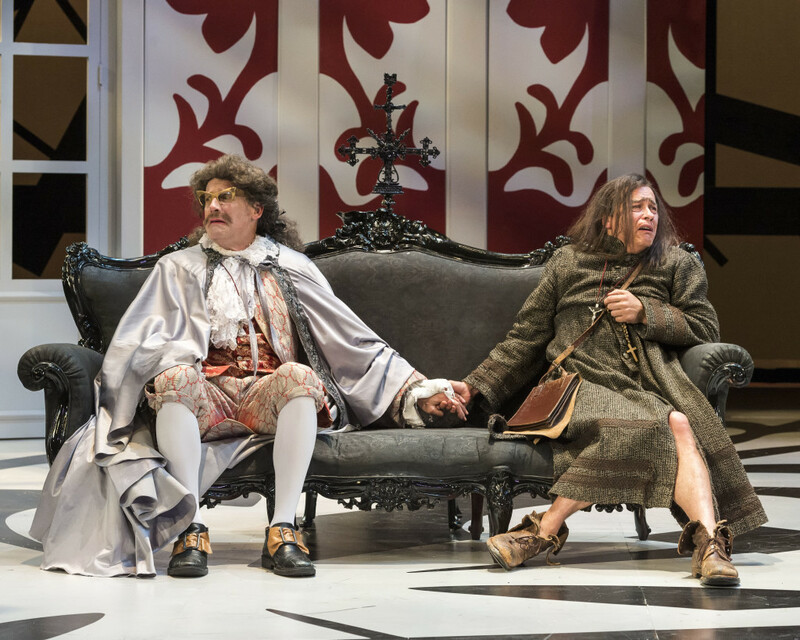 “The Imaginary Invalid” plays in repertory with Tom Stoppard’s “Arcadia” and Jean Genet’s “The Maids”.